Like any wood burning application stoves require regular maintenance. Metal components can warp or burn out, gaskets can fail, and stove pipes can rust out. Thankfully we are here to repair your stove, get you up to code, and ensure all aspects of the system are safe and running optimally. Below is a list of common repairs we perform to stoves. Very often when we are performing an inspection we will find a combination of these issues. When seen, we will recommend the necessary fix. Stove Pipes - Often pipes will need replacing, screws added, or reconfiguration. 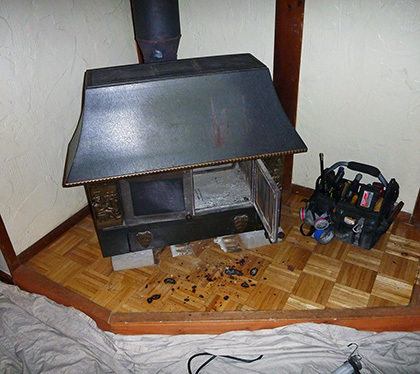 Stove Paint - Over time surface rust and staining can form which we are able to repair via stove specific paint. Gasket Repair - When gaskets become hard and brittle it is time to replace them. Door Glass Panels - If broken or cracked this is a repair that should be taken care of immediately as when hot they can shatter. Dampers - We can either repair, adjust, or add a damper to your stove. Fire Bricks - From heat and usage, fire bricks can crack. Baffle Repair - Baffles often warp and become jammed or have missing insulation. If you think your system needs repair we recommend starting with a Level 1 Inspection to determine your system is safe or not. If something is visibly broken, we can certainly give you a free estimate as well. Head over to the contact page to get in touch with us.